Vadis Turner is a textile artist whose often painterly sculptures transform the fabrics of traditionally female home crafts into gorgeous, voluptuous works that are simultaneously feminine, feminist and even fantastical. The Nashville-born artist’s current exhibition at the Frist Center for the Visual Arts, “Tempest,” features a number of these painterly wall pieces that Turner has concentrated on since returning to Nashville in 2014 after years of living in Boston and New York. Admirably, the other two-thirds of the exhibition offers newer explorations with different arrangements of materials. I’ve written a lot of positive words about Turner’s work in the last several years, but when I go to a gallery I want to see risk and mystery and failure and revelation. Turner’s efforts beyond her familiar ribbon-dripping wall sculptures are hit or miss here, but the best among them offer a new take on the painterly values that have always informed her work. “Tempest” is divided into three themes across three spaces. The Wild Woman, The Mother, and The Elder offer up Turner’s take on the traditional maid, mother, and crone archetypes that also make up the Triple Goddess of contemporary neo-paganism. I didn’t notice these delineations when I visited the show – I’m drawn to Turner’s work for its intense formal beauty, not for contextualizing narratives or political or social statements. As a younger artist – perhaps a Wild Woman in the language of this display – Turner made wedding cake sculptures out of tampons, and lingerie and prom dresses out of wax paper. Nowadays the artist’s feminist messaging is more implicitly embedded in the materials themselves, and the shift has resulted in better art and smarter, more effective messages. The massive wall sculptures in The Wild Woman section help acclimate viewers. Turner was originally a painter, and she even refers to the Wild Woman works as “paintings” even though she’s replaced that medium’s pigments and binders with colorful ribbons and cords to create abstract compositions full of sensual textures and lines. The Mother section is the weakest link in this tripartite display, but at first sight, after just leaving a roomful of work I was already very familiar with, I was immediately impressed by the artist’s chance-taking. 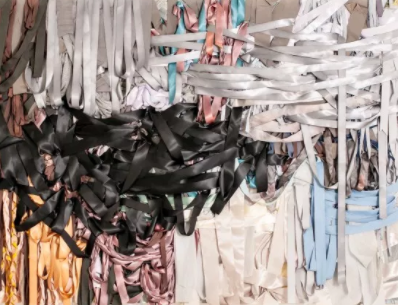 This space is dominated by a number of acrylic resin wall sculptures that incorporate ribbons, thread, and other materials into compositions that ultimately fail to achieve the organic grace and sheer presence of the “paintings” – works like Full Vessel read more like design, and Burn Pile, renderings of wood fires, look like sculptural work-ups of book or magazine illustrations. There’s a sense that Turner might take this work further or take her acrylic resin materials in another direction, and either alternative might be welcome – one hopes that The Mother section presents the middle of a process of discovery instead of a destination. Alternatively, I’d like to see Turner double-down on the quiltlike paintings in The Elder section, where she embraces more representational imagery to create works that imply loose narratives. Place Heirloom 1, Sunrises and Lakes and Spirit Heirloom, Moonlight on a Shimmering Rock present landscapes that use hand-stitched quilts as substrates for ribbons, fabric and other mixed media. Ritual Heirloom 1, Three Seasons and a Winter Flower features three sections juxtaposed like a painted triptych and decorated by a big bold blue sphere. The Elder space ends “Tempest” with a knockout display of breakthrough work that finds Turner taking what is best in her techniques, materials, and ideas to a new place that strengthens her overall exhibition while simultaneously presenting viewers with the thrilling offerings we get when established artists remain restless, reckless, and brave.